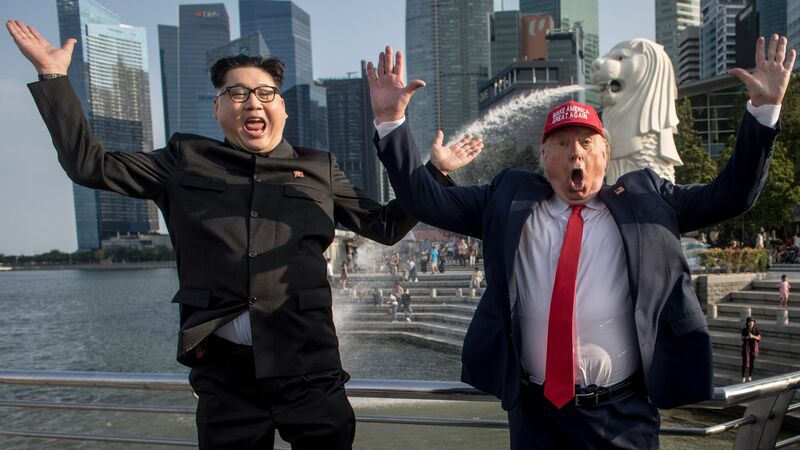 President Trump is on his way to Singapore for the highly anticipated meeting with North Korean leader Kim Jong-un, which starts on Tuesday, and Singapore is already starting to feel the heat. The big picture: More than 3,000 media personnel are descending on the island, the Associated Press reports, as the world braces for the historic summit. That, combined with heavy security presence and impersonators of the two leaders, has led to a feeling of "frenzy unusual for the laid-back tropical state." About the meeting place: The summit will take place at the Capella Singapore hotel on Sentosa Island, the L.A. Times reports. The island is marketed as "the State of Fun," per the Times. It used to be known as "Island Behind Death," because of its history as a prisoner of war camp during WWII for the Japanese. Anyone coming to Sentosa Island, or the streets surrounding the hotels that Trump and Kim are staying in, "will be subject to strict searches," the Times warns. The hotel that will host the meeting is getting special attention, with workers "[sprucing] up the grounds," and applying "a fresh coat of white paint to the exterior." Spokesman to South Korean President Moon Jae-in "urged journalists...to behave," the AP adds, reminding them that Singapore exercises "very strict government power." Two South Korean journalists have already been arrested, per the AP, who were "suspected of trespassing in the residence of the North Korean ambassador." Another journalist from the same national broadcast station, KBS, and an interpreter were also being investigated. Ng Eng Hen, Singapore's Defense Minister, said last weekend that the government providing security and logistics training is "a cost that we are willing to bear to play a small part in this historic meeting," according to the South China Morning Post via Politico. Yes, but: The hotels that Trump and Kim are staying at — Trump at the Shangri-La and Kim at the St. Regis Hotel — will not be covering the costs. Advisories regarding road closures have been issued to residents from Sunday to Thursday. A Mexican restaurant, Lucha Loco, put up pinatas depicting Trump and Kim. The executive chef, Nelson Burgos, told the AP: "We felt that it was a wonderful opportunity to get a little creative and have a little bit of fun." Co-founder of a Singapore-based company Miniature Stories, Caleb Lin, is "selling T-shirts featuring Trump and Kim taking a selfie against" the skyline. He said: "[W]e thought it'd be quite fun to do a tongue-in-cheek T-shirt for the event."